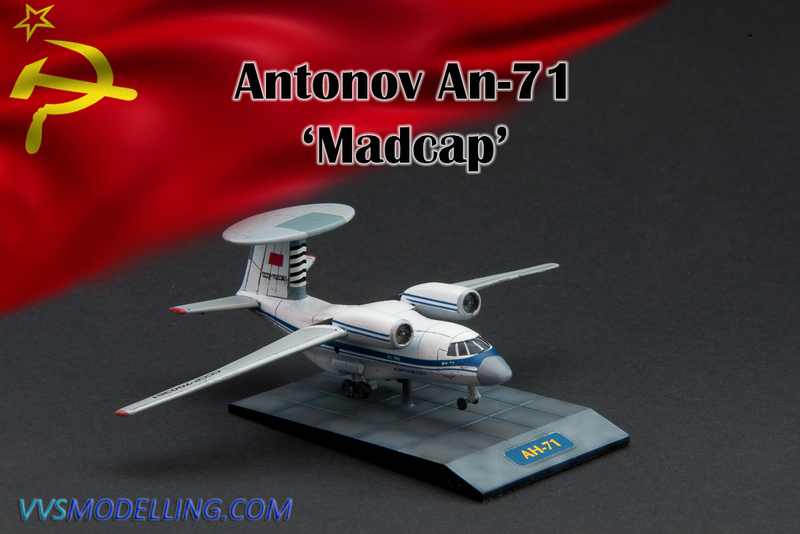 Antonov An-71 ‘Madcap’ was based on the popular An-72 STOL transport series. The aircraft needed only 620m for take-off and 420m for landing and could operate from rough unpaved runways. Over-wing mounted engines greatly reduced FOD risk but also improved its STOL capabilities. Only three An-71 were made with the first take-off in 1985. Unlike An-72, An-71 was equipped with more powerful engines and was also equipped with a third, fuselage mounted jet engine of the same type as Yak-38, that helped with take-offs. Rear fuselage was redesigned and a broad, forward swept fin installed with a radar dome mounted on top. During the times of Soviet Union, each aviation branch had its own Early Warning Radar system in use which it didn’t share with others. So while the PVO (main fighter/interceptor and SAM branch) was equipped with A-50 AWACS, VVS-FA (frontal aviation) strike fighters lacked the capability and the An-71 was developed. There was also a carrier borne version considered under the designation An-75 but it remained a paper project. The two flying prototypes flew around 1.000 hours but the problems with the radar and the eventual fall of the Soviet Union killed the project. I picked up this kit really cheap in Club-TM shop on one of my trips to Moscow. I didn’t have much expectations of this 1:288 Eastern Express kit but in the end, I really enjoyed building it. The fit is rather good, but the plastic is somewhat weird, as the seams were constantly cracking open, as if the solvent wouldn’t work on it (I washed it before building!). The panel lines are engraved although somewhat heavy for the little scale. Decals went down fine, but I had many problems with the size and had to trim them while I couldn’t get a perfect cheat line on the right side of the model. Landing gear are a thing of fiction and the wheels are WAAAAY too small. You get a nice display stand with the kit though.